Pheromone-infused for extra titillation during soothing massages, this soy massage candle by Mojo sets the mood, helps arouse your lover, relax body and mind and nourish skin. Is there anything it can't do?! Order over the phone: Call 0333 103 6969 and quote code 70297. Set the mood: Light the candle to fill the room with romantic (and flattering) candlelight and a aftershave-inspired aroma which gets the juices flowing. Arouse you lover: Infused with pheromones, this candle speaks to the animal in you, flicking those special switches to get you ready for action! Nourish skin: Made from soy wax, coconut oil and shea butter, this candle leaves your skin feeling silky smooth and smelling amazing post-massage. The candle smells really nice, it doesn't have a powerful or overwhelming smell and it takes a few minutes to get things going. My partner and I both enjoyed giving each other a massage with this. It's quite safe and easy to use, and it leaves your skin feeling super soft. Definitely a good change from massage oils. I love candles of any sort. A massage candle is perfect for me. I can enjoy having a candle burning and then enjoy the warm oil over my skin. Be that myself pouring it onto sore muscles or a sensual massage. This candle comes in a cute little gift bag, and a metal tin. The smell of the candle is strong, and becomes much stronger when burning. I have to admit I enjoy this candle just for the smell it leaves in my room. It's a delicious smell that seems to last for hours. The oil smooths onto the skin nicely, and soaks in quickly without leaving an oily residue on the skin. Skin is left feeling soft and smelling delicious. I have very sensitive skin and this did not irritate it at all. A great price, for a brilliant massage candle. Definitely one of the best ones I've tried so far. I'd like a bigger version. Not only does Lovehoney have an amazing website, but thanks to joining their awesome community forum I got to test this amazing product! Thank you. 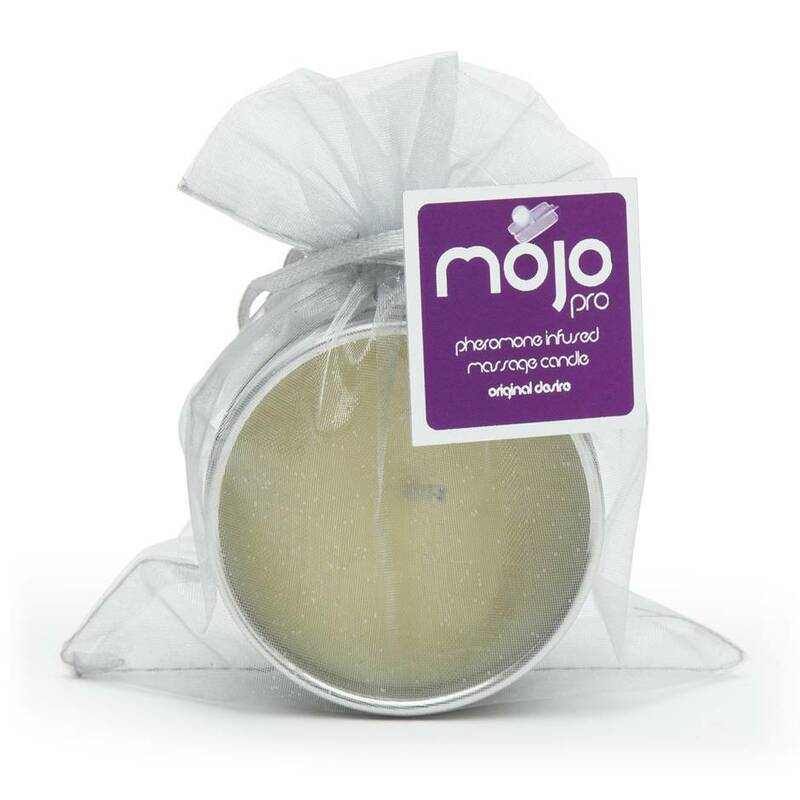 The Mojo Pro original desire Pheromone soy massage candle is described as “pheromone-infused for extra titillation during soothing massages, this soy massage candle by Mojo sets the mood, arouses your lover, relaxes body and mind and nourishes skin". Usually, when reviewing I would use my own words, but if I am being completely honest the description really says it best! It absolutely does what it says on the tin. When we lit the candle, the first thing I said to my husband was that the smell reminded me of him, which was a turn on straight away. Not only did we both find the smell intoxicating we also agreed that the massage oil produced felt divine, the warmth perfect for our evening of sensual massage. In the description, it asks “Is there anything it can't do? !” And simply the answer is no. I would recommend this product and will be treating myself to more very soon! One to add to your collection!